No, it’s not aliens writing messages in the sand. But there is something weird happening on Mars’s surface — and it’s something that hasn’t been seen anywhere else in the universe. The research into the unique Martian features was led by Caltech’s Mathieu Lapôtre and is detailed in Science. The researchers say that the ripples are formed by the wind, and they owe their unique appearance to some peculiarities of the Martian atmosphere. We see sand dunes formed by the wind here on Earth, too, of course. 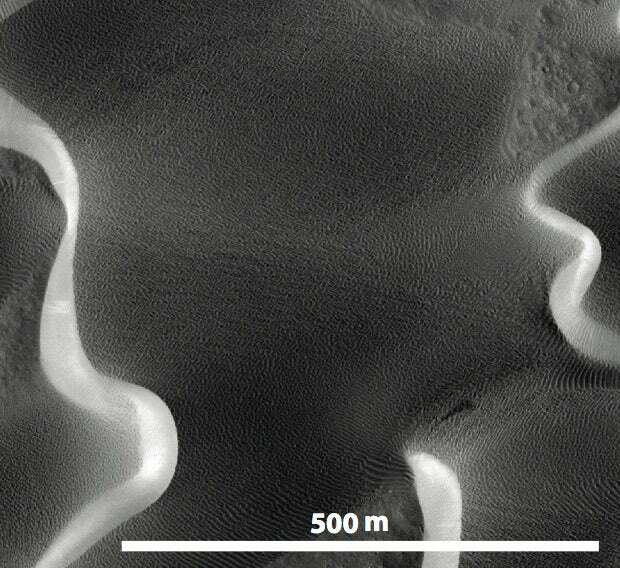 But these Martian sand formations are something completely different. 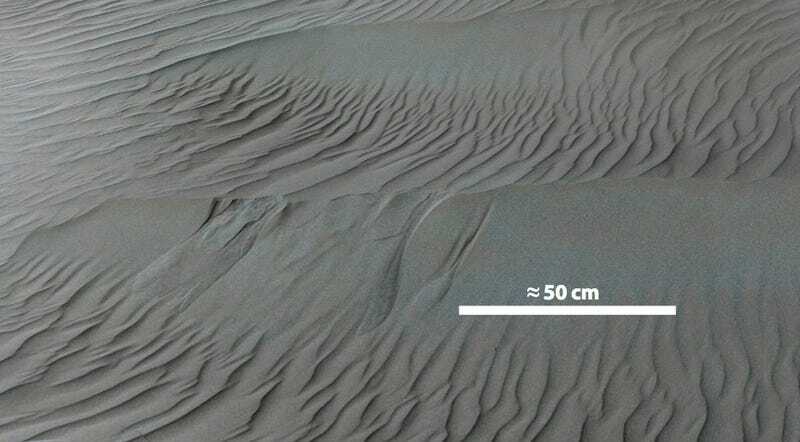 The tiny peaks are not as big as the dunes we see form on Earth, and yet they’re much bigger and sturdier than the ripples that a breeze stirs up in the sand. In fact, the formations, which the researchers are calling “wind-drag ripples”, look like something on Earth — but not anything we see on land. Instead, they look remarkably similar to underwater currents. The reason for the similarity, Lapôtre told Gizmodo, is Mars’s thin atmosphere. “It is the low density of the Martian atmosphere that increases the viscosity of air on Mars,” he said, “and thus promotes the formation of the large Martian ripples through wind-drag”. Although the feature has only been spotted on Mars so far, Lapôtre thinks it’s possible we’ll find similar features elsewhere — we just haven’t gotten close enough to see them yet. The formations don’t just look interesting; they could also reveal how Mars’s atmosphere, which was once more Earth-like, became the way it is. “Because the spacing and size of wind-drag ripples vary with the density of the atmosphere under which they form, we can now look for preserved ‘fossil’ wind-drag ripples in ancient sandstones on Mars, and constrain past atmospheric conditions,” Lapôtre said. He’s already used the technique on the 3.7 billion year old Burns Formation in Victoria crater, which Opportunity visited in 2007. Although the formation is incredibly old, the ripples are still present. That means that Mars probably lost its thick atmosphere sometime before that 3.7 billion year mark.